WEDNESDAY, Jan. 24, 2018 (HealthDay News) — As a nasty flu season rages throughout the United States, new research finds that one particularly vulnerable population often misses out on tests for the illness. 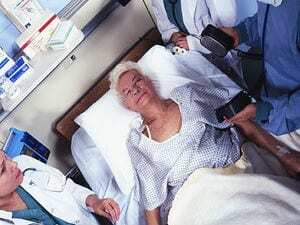 Among hospitalized people, older patients are much less likely to be tested for flu than younger patients, the new study found. That’s important, because the U.S. Centers for Disease Control and Prevention says that people over 65 are among those most prone to severe, life-threatening cases of flu. “Influenza is a common cause of hospitalization in older adults, but it is often under-recognized,” said study author Dr. Lauren Hartman, from the Vanderbilt University School of Medicine in Nashville. To assess whether hospitalized seniors get tested for flu when they have symptoms, Hartman and her colleagues analyzed data on more than 1,400 adults. All had been hospitalized with symptoms of acute respiratory illness or fever at four hospitals in Tennessee during previous flu seasons, from late 2006 to early 2012. The study found that 28 percent of the patients had flu testing ordered by their health care provider. Compared with those who were not tested, those tested tended to be younger (age 58 vs. 66, on average) and more likely to display signs of a “flu-like illness” (71 percent vs. 49 percent). “It is important that physicians consider influenza in hospitalized older adults because antiviral treatment [such as Tamiflu] is beneficial if given early,” Hartman said in a journal news release. This can keep the flu virus from being spread to other vulnerable patients, she said.